Our publications provide a wealth of education and information, which further enhances the value of membership in the IAFE. 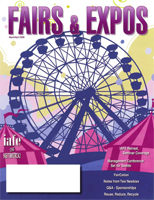 Fairs & Expos magazine, printed six times each year, provides in-depth, feature articles that focus on improving agricultural fairs. Fairs & Expos magazine provides our membership with a tangible tool that keeps them up to date on fair news and the latest trends in the wonderful world of fairs. If it is fair information you want, the IAFE Directory is the publication you need. This comprehensive list of IAFE members is a connective tool for IAFE members. Our publication staff goes to great efforts to provide accurate listings for all IAFE members in this Directory, which is printed in January of each year. Don't forget to take advantage of our special advertising opportunities. Increase your industry exposure through our publications, web site, and other avenues.